Elliot, L.M. Hamilton and Peggy! Young Peggy Schulyer must watch her older sister Angelica elope with a dashing young man, and is instrumental in helping her sister Eliza's suitor, Alexander Hamilton, connect with his sweetheart. In the meantime, the Revolutionary War is grinding on, and her father, General Phillip Schuyler, is very involved with aspects of the planning and fighting, although he is not always successful in his military endeavors. Peggy meets many of the luminaries of the time, tries to help around the house (her mother is constantly having babies, which becomes more difficult as she gets older and the war continues), and chafes against the restrictions put upon women. She even travels in the bitter winter weather to prove that she is not to be held down! Set against many details of every day life as well as the political machinations of war, Hamilton and Peggy! is a solid historical novel from the wonderful L.M. Elliot. Strengths: Elliot does a great job at weaving in very descriptive military occurrences with every day life in a way that is both instructive but fast paced. This is a very difficult thing to accomplish in historical fiction. This was reminiscent of works of Ann Rinaldi, which always have such great details about life and historical events. Elliot has clearly done her research, and I appreciated the notes at the back. 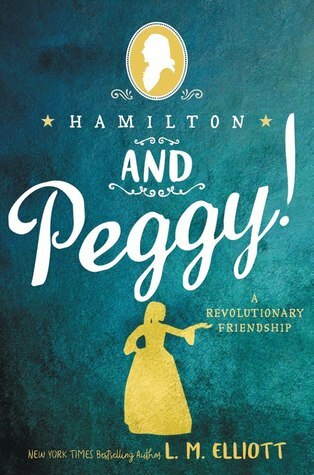 Weaknesses: There is not really very much about Alexander Hamilton in the book, and Peggy is described (in a VERY common historical novel fashion) as being perhaps a bit spunkier and daring than women at that time would have been in real life. It's not unrealistically done, but I always believe deep down that such behavior is probably anachronistic. Makes for a much better story, so it makes sense to portray Peggy this way. What I really think: If Hamilton fever continues, I may purchase a copy. Actually, I will probably purchase it anyway, since there are surprisingly few newer historical novels set during the Revolutionary War. Forbes' Johnny Tremain (1943) has seen better days. In 2164, Time Corp published a series of guides for time travelers, since time travel devices are standard issue in homes, and there is a Time Patrol to fix any problems that wayward time travelers create. Luckily, copies of the books were found in New York City in 2018, and republished for modern readers. Time Corp is headed by the megalomaniac Finn Greenquill, who gets ample mention in footnotes throughout the book. 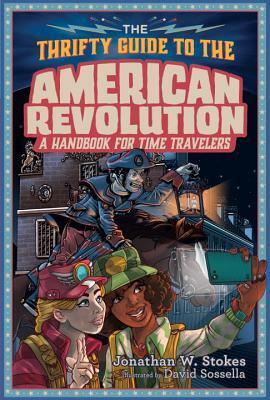 With such an introduction, we can expect The Thrifty Guides to be much more amusing than Lucent's Travel Guides or Lerner's Passports to History, which are much better at laying out information that actual time travelers might need. While there is good information about what to wear and eat, the main concern of this book is staying alive in the midst of different military actions or while spying. There are some nice overviews of historical figures with whom one might like to eat lunch, and enough information about daily life to keep a time traveler out of trouble, but the main concern is the military action. There are even maps. This will be very helpful to students who have to study these battles in school-- I know that our 8th grade does some large units on Bunker Hill and Concord and have to actually make maps of battle strategies, so the maps included in this book, and the explanations for why the battles occurred, will be very helpful. The asides and additional humorous information make the history more accessible and interesting to readers who are new to the material. My quibble is that I wish more social history was covered in school. How did people dress, what did they eat, where did they shop-- how did they go about their everyday life. What were the social mores? How did families work? What jobs did people have? This information is constantly neglected in the classroom, as well as in historical nonfiction. That said, this quibble is not so much with The Thrifty Guides as it is with the general approach to history, and I am clearly in the minority on this one. The Thrifty Guides are a nice supplement to topics covered in middle school social studies and could be put to good use in the classroom setting, as well as for pleasure reading. You make a valid point. The American Revolution is underrepresented in juvenile historical fiction. Other than Johnny Tremain, as you mentioned, nothing is coming to mind. I am going to add The Thrifty Guide to the American Revolution to my list. Thanks. I've been wondering about Hamilton and Peggy! I have Hamilton fever, so I may have to include this one on the TBR! Hmmm...I can't think of any other novels set during the American Revolution either. I would never have guessed that Johnny Tremain was written so long ago. That is one of the books that always stands out to me when I think about school reading I did when I was younger. I did some searching and you're right! We need new children's fiction about the Revolution. All I could find was Johnny Tremain, books by Avi & the Collier Brothers. It would be nice to have a story set then that isn't all about war, too. Thanks for the post, Karen. Regarding your quibble, I agree with that (it was the same even when I was growing up in India - not enough social history covered in school; on the one hand, history was a subject by itself for a few school years; on the other, books I read later in life had so much information that would have been great to be part of the school reading)..
and Hamilton - that fever is still on! so that first book might be something I will check out too.. Both historical fiction books sound intriguing. It is hard to find books. I've reviewed Michelle Isenhoff's historical fiction for middle graders and she has one, The Color of Freedom about the revolutionary war, as well as a wonderful trilogy before, during and after the civil war, "The Divided Decade Trilogy. Brilliant writer. Laurie Halse Anderson's YA series is about the Revolutionary War.